IMRAN KHAN – The Next Prime Minister in Waiting of Pakistan, has been a former Pakistan cricket star with an aim to transform the country and end corruption. Mr. Khan who is 65 was born on 5 October 1952 in Lahore, Punjab and started playing cricket at the age of 13. He has proved to be a great leader and become most successful captain of Pakistan with winning World Cup in 1992. In April 1996, he founded his party Pakistan Tehreek-e-Insaf (Pakistan Movement for Justice). He was a member of the National Assembly of Pakistan from 2002 to 2007 and then from 2013 to 2018. Motivation can do wonders! In every space of life, whether its professional or personal, a person needs to have the courage and motivation to fight the difficulties. 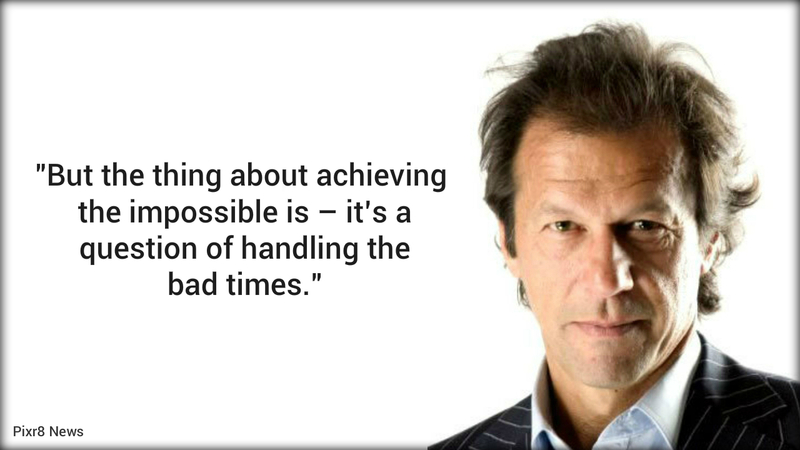 In 2011, Imran Khan expressed this thing beautifully at the TEDxKarachi event in 2011. Imran through his inspiring story proved to the people that he is an all-rounder and an immensely hard working person who never gives up no matter how many failures he has to face. He has faced many failures and setbacks in life where a normal person might have given up! But he moved forward and fought all his failures and eventually became a man who inspires all. His very first challenge in life was cricket. Getting inspiration from his older cousin Javed Burki who scored a century, he was just nine when he decided to become a test cricketer. 1) It was his first test match where he failed and the post-match headlines read: “Imran Can’t”. He was dropped and didn’t play for the next three years, he was out of the team. He made a comeback and played his first match in Lahore. Again, in this match, he was out on the very first ball. He had to get over that and over the years, got used to it, but did not give up. 2) He with his team toured to India for the first time and lost. He expressed his grief by telling about the team meeting that they had after the match to discuss ‘How can we arrive in Lahore when everyone is asleep?’ He also stated that the players had to hide in their houses because fans were angry. 3) Another failure that he faced was when he contested his first election with his five months old party and lost. By this time, Imran was conditioned to seeing ups and downs and had clear mechanisms of how to cope up with the failure. “Failure can be the best teacher provided you do not get demoralized by failure. If you get demoralized, you’ve lost. If you can assess and analyze your mistakes, it is a stepping stone to moving higher,” he said. 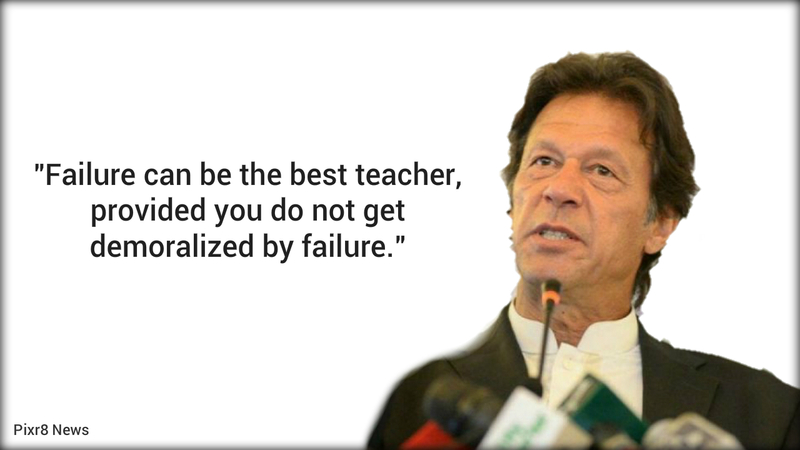 Instead of all these major failures and setbacks in his life, Khan didn’t give up. This was not all, apart from this, he had faced a lot more difficulties in life where he fought back and gained the victory. He has set an example for all the people who get weak in the times of failure. 1) When he started playing at the age of 18, he was inspired by an Australian cricketer Dennis Lillee and wanted to be a fast bowler. His coaches discouraged him that he did not have the required physique and the bowling actions to become one. But, with his hard work and never giving up attitude, he has been the only bowler in the history of cricket to completely remodel his action to suit his ambition. 2) He made his debut for the Pakistan national cricket team at the age of 18 during the 1971 series against England. After graduating from Oxford, Khan made his home debut for Pakistan in 1976, and played until 1992. Khan also served as the team’s captain intermittently throughout 1982–1992. He, notably, led Pakistan to victory at the 1992 Cricket World Cup, Pakistan’s first and only victory in that competition. 3) Seeing his mother in pain, thinking about the poor people who go through cancer, he campaigned for the hospital, that would primarily be a free hospital and along with that, it would not discriminate between the rich and the poor. Even this time, he faced many hurdles but fought all of it, and successfully founded the country’s first cancer hospital that provides free treatment to the majority of its patients annually. For this initiative, he was awarded by the World Health Organization (WHO) as the center of excellence and the only private cancer hospital in the world which gives 75% of free treatment. 4) He went on to build a little technical college for young men who were unemployed and thus, ended up either on a high rate of drug addiction or crime. He decided to get Bradford University to that area, but everybody told him that he can’t build a university in a rural area like Namal, due to the lack of faculty. He kept on to work for it and today, it is the first private sector university in a rural area and wild area with a culture of co-education. “I draw my experiences from two areas, one was cricket in Pakistan, we produced the world cup winning team despite having no system in the country, despite the system, not because of the system. There’s no cricket system in Pakistan. And for all of you sitting here, if nothing else I am a triple Ph.D. in cricket and I can tell you, never nowhere in the world have I seen such sporting talent as in this country,” he expressed. He worked hard for his goals, day and night, until one day, it paid off. He said all he ever dreamt was to become a fine successful player and he did that. It was his hard work, persistence, and degree of desire that leads him to the milestone where he desired to be. Imran Khan has also received many prestigious awards for his outstanding work for public welfare and personal achievements. And with his never giving up attitude, he proves to be the perfect leader who can lead the country to great heights. He has promised the people to eliminate corruption and also improve relations with China. Also, he expects to seek a mutually beneficial relationship with the US and build a welfare state along the lines of Prophet Muhammad. His political fortunes were changed last July when the Supreme Court disqualified three-time premier Sharif in a case that judges only took up when Khan threatened to paralyse the capital Islamabad with his supporters. With this, as prime minister, he stated that he will partially model his promised anti-corruption campaign and poverty reduction programmes on China, Pakistan’s traditional ally that has financed billions of dollars of infrastructure projects. More than 20 years after he founded his political party, the Pakistan Tehreek-e-Insaf (Pakistan Movement for Justice), Khan still is respected by many as captain of Pakistan’s 1992 World Cup-winning cricket team.